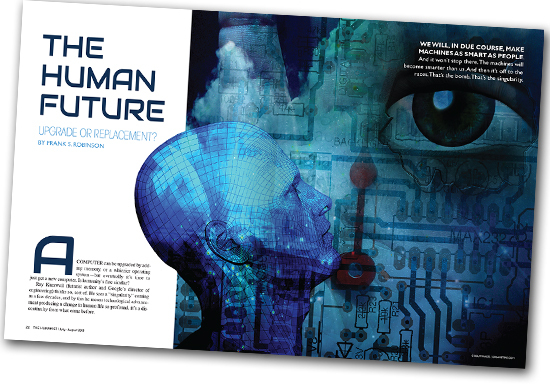 The Human Future: Upgrade or Replacement? A computer can be upgraded by adding memory, or a whizzier operating system – but eventually it’s time to just get a new computer. Is humanity’s fate similar? Ray Kurzweil (“author and futurist”) thinks so, sort of; he sees a “singularity” coming in a few decades. That is, technological advancement changing life so profoundly it’s a discontinuity from what came before. But many actually think technology, productivity gains, and innovation have stalled, and past progress may really represent the picking of low hanging fruit. We have indeed already invented the obvious big things, with further innovation being mainly tweaking and improvement. The computer was a comprehensive game-changer – but can we imagine some analogous future game changer? Actually, yes: Artificial Intelligence (AI). It’s a bomb waiting to go off. Some think AI research has been a dead end. It’s true that some early over-enthusiasm has proven misplaced, and replicating human intelligence is very hard. But while our brain architecture is admittedly extremely complex, it’s built from a quite limited set of genetic instructions, that merely provide general guidelines by which the developing brain wires itself. AI is moving in a similar direction, creating systems that can learn and increase their own complexity. You probably have one in your pocket. 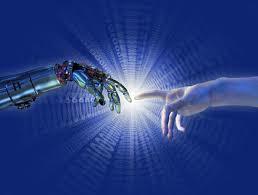 So far we have not created a machine that matches human intelligence, but that will inevitably happen. And it won’t stop there. The machines will become smarter than us. That’s the bomb. That’s the singularity. Because then technological advancement goes into overdrive. Scientific and technological problems will be attacked with brainpower far beyond ours. That will include the smart machines’ own further improvement. And there will be a worldwide network of them – a global intelligence. This is what the “limits to growth” doomsayers, who believe we’re destroying our future, overlook. They fail to realize how different the future will actually be. Our environmental and resource challenges, too, will be tackled by capabilities vastly greater than ours today. 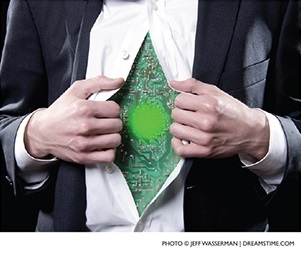 Will they, however, remain just glorified machines – or become something more? Consciousness is not ineffable or mystical; it’s an emergent property devolving out of the complexity of the signaling among the brain’s neurons. If that can be mirrored in an artificial system, there’s no reason in principle why it cannot be self-aware. Indeed, if the machines can outstrip (by far) our intelligence, could they not also attain some even higher form of consciousness? So what then becomes of us, the primitive 1.0 version? Upgrade, or replacement? But rather than a divergence between fleshly humanity and mechanical super-intelligence, we should actually expect more of a merging. We’re already seeing the beginnings of our de-biologization when quadriplegics can manipulate physical objects with their minds, and we debate whether a runner should be allowed to compete because his artificial legs are better than real ones. When you junk an old computer, it’s not the death of your computing life – you migrate it to a new machine. For humans of version 1.0, the ascent to 2.0 will probably be like that. So those future super-intelligences will be our own progeny; will be us, humanity 2.0, or 10.0, or 1022.0. Much has been written lately about how our evolutionary biological past, embedded in our genes, shapes who we are, and not entirely in a good way. We carry a lot of such baggage. We’ve overcome many of its limitations through knowledge and technology, performing thereby a kind of evolutionary hat trick. Our next evolutionary hat trick will be to simply leave all that biological baggage behind. Will there be problems and downsides? Hoo boy. Those who today rail against Genetic Modification, nanotech and “playing God,” will have a field day. Bill McKibben has actually said we’ve had enough progress, and it should stop. But, like always, progress will blast past such Luddites, and notwithstanding the inevitable problems, the bigger picture will be human improvement so vast that future anti-evolutionists will disbelieve their descent from lesser creatures made of (yuck) flesh and blood. Kurzweil (in his book The Singularity is Near) posits six stages of evolution. 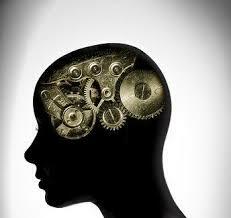 In the final stage, intelligence pervades all matter. The Universe wakes up. There is no god – yet. This entry was posted on July 7, 2013 at 5:43 pm and is filed under Philosophy, Society. You can follow any responses to this entry through the RSS 2.0 feed. You can leave a response, or trackback from your own site. So here I am reading McKibben’s “eaarth” and probably “his Ilk, ” Jensen’s “Engame”, Parts One & Two and on a bit more positive note, Lynas’s “The God Species” (it was good day at the library new books shelf) and I take a break to check my e’s and read Frank’s “Human Future” piece. Nice piece Frank but I’d just say we need artificial intelligence as our first, if not last, call for our current personal medical problem and a host of other close-up personal issues and we need it to address the very real concern’s addressed by McKibben and his ilks. To “Gaming” — ?? I don’t think so! want to say about this post, in my view its truly remarkable in favor of me.